If you seek comfort and handling: Touring tires help provide excellent dependability on wet and dry pavements. They offer a balance of smooth and quiet ride with performance handling. If you drive a sports car, or look for handling and performance: High-performance tires are designed for use at higher speeds in dry and wet weather. They have a softer rubber compound for improved grip, especially on high-speed cornering. * If you drive a pick-up truck or an SUV: Light truck tires help provide durability and traction in adverse off-road conditions. On the flip side, SUV tires are ideal for on-road, comforttuned SUV applications. If you own a commercial vehicle: Commercial light truck tires are designed to handle driving through dirt, mud and everyday wear and tear from commercial applications. Ensure that your new tires meet your needs. Think about not only the typical conditions, but also the worst conditions you foresee driving in. What performance criteria are you looking for? For example, is wet traction more important to you than cornering capability on dry roads? The more you can tell your dealer, the easier it will be to find the right tire for your needs. Winter tires are designed to perform in cold, icy, wet and snowy weather. They are optimized for handling and traction under wet conditions, but can be used in dry conditions, as well. Most automobile tires are all-season tires. These tires satisfy the needs of most road conditions. They not only have the deep water channels for wet traction, but also harder rubber compound for greater tire life in warm weather. Off-road tires are ideal for drivers who take their vehicle off the road and do limited on-road driving. These tires have stiffer sidewalls for greater resistance against puncture when traveling off-road. The tread pattern offers wider spacing than an allseason tire to help remove mud from the tread. 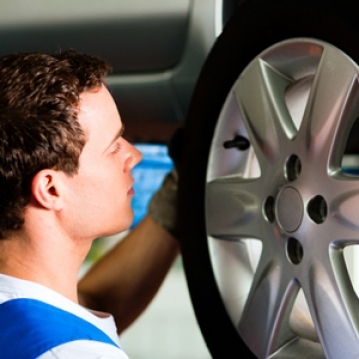 Tire Size Knowing your tire size can save you time and help you to make an informed purchase. Your vehicle´s original tire size can be found in your owner´s manual or on the tire label located on the driver´s doorjamb, glove box lid, or inside the fuel hatch. If in doubt, consult your local Uniroyal tire retailer or check your sidewall (see diagram below). Aspect Ratio: The relationship between the tire height and width. In this example, the tire height is approximately 60 percent of the tire width. Radial: The letter "R" indicates a radial construction of the carcass plies. The carcass plies run across the tire from lip to lip, helping to provide strength, stability, flexibility, and ride comfort. Load Index: The load index can range from 0 to 279 and indicates how much weight the tire is certified to carry at maximum inflation pressure. Never buy a tire with a lower load index than your vehicle´s original tire. To determine your tire’s load capacity, refer to the load index chart (see below). To maintain the speed capability of a vehicle, use replacement tires with ratings equal to or greater than those of the original tires. Mud & Snow: The letters M and S indicate that this tire meets the Rubber Manufacturer´s Association´s standards for a mud-and-snow tire. The letters can be found in the following combinations: M S, M/S, and M&S. Allseason tires carry this mark. Note that a separate, severe-snow marking appears on winter tires that are designated for severe-snow applications. Tips: Never choose a tire that is smaller than the tire that came with the car. If you are interested in a size other than your vehicle´s original equipment, or are upgrading, consult your local tire retailer. Tire Mixing (if buying fewer than four tires) For front- or rearwheel-drive vehicles, we recommend mounting the new tires on the rear axle to prevent an unstable oversteer condition. When purchasing a single new tire, it should be paired on the rear axle with the tire having the greatest remaining tread depth. • Do not mix sizes -- all four tires must be branded with the same tire size • Do not mix radial and bias-ply tires. • Outside circumference of all four tires should be within one-and-a-half inches of each other. • Do not mix tread patterns, such as offroad and all-season. • Exceeding the safe, legal speed limit is neither recommended nor endorsed. Happy MotoringDo´s and don´ts of your carRepair my old vehicle or purchase a new modelWhy Zero Teen Fatalities?PCM Powertrain Control ModuleHow many times have you had your vehicle´s check engine light on?